The center began to educate parents on the benefits of healthier food choices, their effects on children’s development and learning abilities through parent orientations, monthly meetings and parent conferences. Fun activities, such as Food Day and Fall Festival, were a part of the parent education outreach. Each month, newsletters are sent out with excerpts on healthy eating for young children. At parent meetings, various statistics and information on healthy eating are shared. 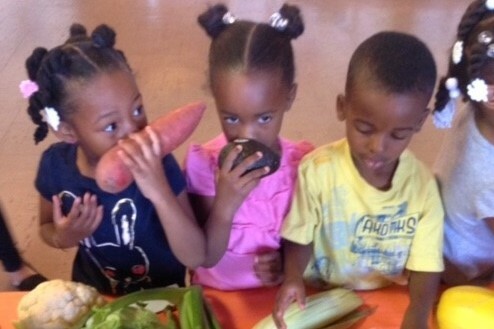 The center strives to teach parents that the early years are the time to establish a proper diet. If children learn about the importance of eating healthy early in their lives, they will not have to relearn healthy habits as adults. The parents gradually saw the benefits of the changes. They started to incorporate healthier options in the family meal planning process and began to share their successes and failures with one another at the parent meetings. During the Food Day celebration, the parents were given a list of fruits and vegetables from which they selected an item and brought it in for all the children to taste. Many parents reported selecting items that they had never tasted either so that they could try something new as well. “’Transformation’ would be the one word to describe this experience. Through this, I have changed, the teachers have changed, and the parents and the children have changed. Our focus is on balanced meals that include a variety of well-prepared foods that provides the foundation for developing positive attitudes towards foods, understanding good nutrition and forming lifelong good eating habits,” says Davis. Child care staff at Angeles Mesa YWCA in Los Angeles was concerned with a number of unhealthy practices. Head Teacher, Colleen Rodriguez, decided to lead the center in healthier habits and implemented policy changes. 100% of staff has reported adopting healthy choices in their personal lives as a result of these changes. “What’s Cooking?” is a robust resource from the USDA about healthy eating and cooking tips; includes recipes for large groups to help with menu planning.